(Nanowerk News) The transport of nanparticles to a new target environment is often needed in medical applications. Inclusion bodies or host–guest systems are of special interest, however, their design is especially challenging, and nanocolloids formed from inorganic components are rare, although they have the advantage of being functionalized relatively easily. In the journal Angewandte Chemie ("Dynamic Inclusion Complexes of Metal Nanoparticles Inside Nanocups"), scientists from Stuttgart, Germany, describe an intriguing new approach to fabricate a functionalizable host–guest system from pure inorganic components. The system involves nanocup-shaped inorganic colloids that harbor gold nanoparticles, which can be easily released by an external stimulus. Stabilizing nanoparticles in solutions is often achieved with the help of surfactants or polymers. However, this involves modification of the metal surface itself. A purely inorganic approach would be advantageous. Therefore, by combining physical vapor deposition and wet chemical processes, his group prepared inclusion complexes of a gold nanoparticle confined in a silica or titanium dioxide nanocup. The gold could be released simply by acidification, like emptying a bag. Key to this approach is the fabrication of inorganic Janus nanoparticles, particles with different functionality on both sides. 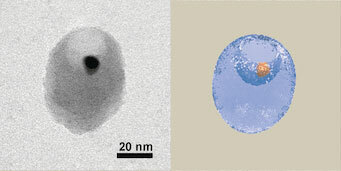 Silver–gold Janus particles were preformed on a silicon wafer, and oxide was then deposited on these particles to give so-called double Janus particles. Then, the silver was oxidized and dissolved, while the gold nanoparticle remained deeply encapsulated inside the oxide cup cavity, held tightly by ionic forces between the gold and the oxide atoms of the cavity surface. To demonstrate the functionality of the colloidal host–guest system, the scientists emptied the cup just by adding acid, breaking the bond between the gold and the cavity. The oxide cup can be further functionalized for utilization in salty environments, in organic solvents, and for the assembly and stabilizing of emulsions and colloids, Fischer says. Other materials are also available. “It is possible to chemically convert a metal such as Ag even to semiconductors and thus extend the range of possible materials”, he adds. The new approach by Fischers and co-authors Alarcón and Lee gives an intriguing new perspective on the preparation of inorganic functional colloid systems.